North Texans are cordially invited to an Education Open House at Stage West Theatre, Saturday, August 4th, from 10 am until 2 pm. There will be on-site registration and activities throughout the event, including sample classes, discounts on tuition, and prizes! As the premiere professional regional theatre in Fort Worth, Stage West is committed to bringing the highest level of professionalism and artistic expression to everything we do. That includes our education program. Creativity, confidence, and collaboration are essential skills that young people learn through theatre education. All our classes are taught by professionals in the field. We introduce young actors, artists, and playwrights to the process of creating theatre while having fun! Younger classes focus on creativity, confidence, and teamwork, all in a supportive environment. 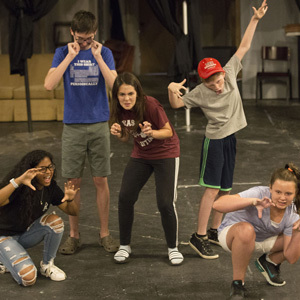 As classes progress, students become focused on deeper technique in how to perform, create characters, and prepare them for their next big role. Our production classes introduce theatre concepts through auditioning, rehearsing, and performing a full musical or play. Stop by to sample our schedule of fall classes, meet instructors, and sign up for the Fall!